The Government of Andhrapradesh released APTET 2018 initial keys of all papers and give a chance to appeal any objections in APTET KEY. Now we have a facility to rise our objections on this TET INITIAL KEYS. 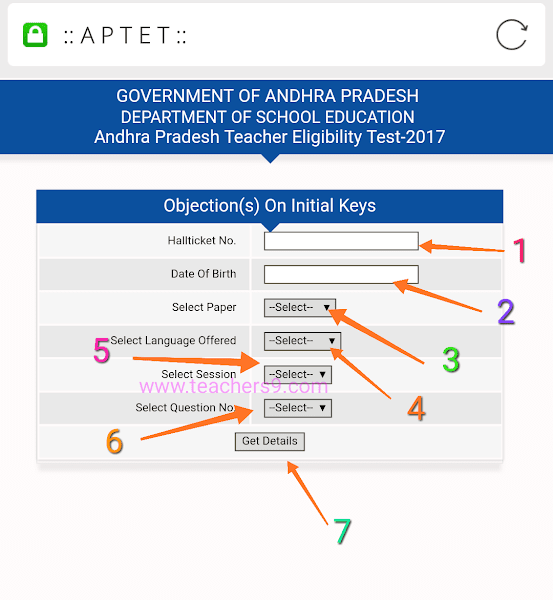 Step by Step guide to submit our objections on APTET INITIAL KEYS. 2.Enter your hall ticket number. 3.Enter your date of birth. 8.Finally press on get details button. Then you will get your relative quetion and answers options in a new pane. Select correct option and submit your objection details.